"Passionfruit" and "Passion fruit" redirect here. For the fruit, see Passion fruit (fruit). For other uses, see Passion fruit (disambiguation). Passiflora edulis is a vine species of passion flower that is native to southern Brazil through Paraguay and northern Argentina. It is cultivated commercially in tropical and subtropical areas for its sweet, seedy fruit, commonly called passion fruit. The fruit is a pepo, a type of berry, round to oval, either yellow or dark purple at maturity, with a soft to firm, juicy interior filled with numerous seeds. The fruit is both eaten or juiced, the juice often added to other fruit juices to enhance aroma. The passion fruit is so called because it is one of the many species of passion flower, the English translation of the Latin genus name, Passiflora. Around 1700, the name was given by missionaries in Brazil as an educational aid while trying to convert the indigenous inhabitants to Christianity; its name was flor das cinco chagas or "flower of the five wounds" to illustrate the crucifixion of Christ, with other plant components also named after an emblem in the Passion of Jesus. P. edulis is a perennial vine; tendrils are borne in leaf axils, and have a red or purple hue when young. There are two main varieties: a purple-fruited type, P. edulis f. edulis, and the yellow-fruited P. edulis f. flavicarpa. Usually the vine produces a single flower 5–7.5 cm wide at each node. The flower has 5 oblong, green sepals and 5 white petals. The sepals and petals are 4-6mm in length and form a fringe. The base of the flower is a rich purple with 5 stamens, an ovary, and a branched style. The styles bend backward and the anthers, which are located on top of the styles, have a very distinct head. The fruit produced is entirely fleshy (making it botanically a berry), and is spherical to ovoid. The outside color of the berry ranges from dark-purple with fine white specks to light yellow. The fruit is 4—7.5 cm in diameter; purple fruits are smaller, weighing around 35 grams, while yellow fruits are closer to 80 grams. The smooth, leathery rind is 9–13 mm thick, including a thick layer of pith. Within the berry, there are typically 250 black seeds, each 2.4 mm in length. Each seed is surrounded by a membranous sac filled with pulpy juice. The flavor of the juice is slightly acidic and musky. The passion fruit's flavor can be compared to that of the guava fruit. Several distinct varieties of passion fruit with clearly differing exterior appearances exist. The bright yellow flavicarpa variety, also known as yellow or golden passionfruit, can grow up to the size of a grapefruit, has a smooth, glossy, light and airy rind, and has been used as a rootstock for purple passionfruit in Australia. The dark purple edulis variety is smaller than a lemon, though it is less acidic than yellow passionfruit, and has a richer aroma and flavour. Passion fruit has a variety of uses related to its appealing taste as a whole fruit and juice. In Australia and New Zealand, it is available commercially both fresh and tinned. It is added to fruit salads, and fresh fruit pulp or passion fruit sauce is commonly used in desserts, including as a topping for pavlova (a regional meringue cake) and ice cream, a flavouring for cheesecake, and in the icing of vanilla slices. A passionfruit-flavored soft drink called Passiona has also been manufactured in Australia since the 1920s. It can be used in some alcoholic cocktails. In Brazil, the term maracujá applies to passion fruit (maracujá azedo, or "sour") and granadillo (maracujá doce, or "sweet"). Passion fruit mousse is a common dessert, and passion fruit pulp is routinely used to decorate the tops of cakes. Passion fruit juice, ice pops and more recently soft drinks are also popular. When making caipirinha, one may use passion fruit instead of lime. In Colombia, it is one of the most important fruits, especially for juices and desserts. It is widely available all over the country and three kinds of "maracuyá" fruit may be found. In the Dominican Republic, where it is locally called chinola, it is used to make juice and Fruit preserves. Passion fruit-flavored syrup is used on shaved ice, and the fruit is also eaten raw, sprinkled with sugar. In East Africa, passion fruit is used to make fruit juice and is commonly eaten as a whole fruit. In Hawaii, where it is known as liliko'i, passion fruit can be cut in half and the seeds scooped out with a spoon. Lilikoi-flavoured syrup is a popular topping for shave ice. It is used as a dessert flavouring for malasadas, cheesecakes, cookies, ice cream and mochi. Passion fruit is also favoured as a jam or jelly, as well as a butter. Lilikoi syrup can also be used to glaze or to marinate meat and vegetables. In India, the government of Andhra Pradesh started growing passion fruit vines in the Chintapalli (Vizag) forests to make fruit available within the region. The fruit is eaten raw, sprinkled with sugar and is also used to make juice. In Indonesia, there are two types of passion fruit (local name: markisa), white flesh and yellow flesh. The white one is normally eaten straight as a fruit, while the yellow variety is commonly strained to obtain its juice, which is cooked with sugar to make thick syrup. In Mexico, passion fruit is used to make juice or is eaten raw with chilli powder and lime. In Paraguay, passion fruit is used principally for its juice, to prepare desserts such as passion fruit mousse, cheesecake, ice cream, and to flavour yogurts and cocktails. In Peru, passion fruit has long been a staple in homemade ice pops called "marciano" or "chupetes". Passion fruit is also used in several desserts, especially mousses and cheesecakes. Passion fruit juice is also drunk on its own and is used in ceviche variations and in cocktails, including the Maracuyá sour, a variation of the Pisco sour. (Granadilla, or "sweet") can be eaten raw. In the Philippines, passion fruit is commonly sold in public markets and in public schools. Some vendors sell the fruit with a straw to enable sucking out the seeds and juices inside. In Portugal, especially the Azores and Madeira, passion fruit is used as a base for a variety of liqueurs and mousses. In Puerto Rico, where the fruit is known as "parcha", it is used in juices, ice cream or pastries. In South Africa, passion fruit, known locally as Granadilla (the yellow variety as Guavadilla), is used to flavour yogurt. It is also used to flavour soft drinks such as Schweppes' "Sparkling Granadilla" and numerous cordial drinks (in cordial flavours it is referred to as passion fruit). It is often eaten raw or used as a topping for cakes and tarts. Granadilla juice is commonly available in restaurants. The yellow variety is used for juice processing, while the purple variety is sold in fresh-fruit markets. In Sri Lanka, passion fruit juice, along with faluda, is one of the most popular refreshments. Passion fruit cordial is manufactured both at home as well as industrially by mixing the pulp with sugar. Raw passion fruit is 73% water, 22% carbohydrates, 2% protein and 0.7% fat (table). In a 100 gram amount, fresh passion fruit contains 36% of the Daily Value (DV) of vitamin C, 42% dietary fiber, B vitamins riboflavin (11% DV) and niacin (10% DV), 12% iron and 10% phosphorus (right table). No other micronutrients are in significant content. Several varieties of passionfruit are rich in polyphenol content, and yellow [Note 1] varieties of the fruit were found to contain prunasin and other cyanogenic glycosides in the peel and juice. Passion fruit is widely grown in tropical and semitropical regions of the world. Within the United States, it is grown in Florida and California. They generally have to be protected from frost, although certain cultivars have survived light frosts after heavy pruning of affected areas. The flower of the yellow-fruited form of the passion fruit plant is self-sterile, while that of the purple-fruited form is self-compatible. Pollination of flowers is most effective when done by the carpenter bee. There are three types of yellow passion fruit flowers, classified by curvature of style. To help assure the presence of carpenter bees, place decaying logs near the vines, which provide shelter for the bees. Passion fruit woodiness virus is one of the most well known viruses to the passion fruit. It belongs to the Potyvirus group and can attack a plant at any age from nursery to mature plants. Some features include yellow leaves that display distortion in the leaf length and shape. As well as affecting the leaf, this virus influences fruit shape and size. Affected fruits become stone-like and much smaller than normal, with many fruits becoming scabbed and cracked. The virus is spread by sap-sucking insects such as aphids and mites. Woodiness can also spread through vegetation propagation such as infected scions or contaminated tools. There is no chemical control for this virus once the plant is infected, but the use of clean planting material can reduce its dissemination. One of the most serious viruses pertaining to vegetation is the Cucumber mosaic virus. In the passion fruit, this virus appears with yellow mottling on leaves starting at random points on the vine and diminishing in intensity towards the tip. Expanding leaves typically become twisted, curl downward, and develop a "shoestring" appearance as a result of a restriction of the leaf surface. It is mobile and can spread easily through interactions with other plants such as brushing between leaves. This virus is naturally transmitted through aphids and can also be transmitted mechanically through seedlings. Varietal resistance is the primary management tool, and eliminating weeds and infected perennial ornamentals that may harbor the virus is critical. Once the plant has been infected, there is no possible management of control for the virus. Overshooting is the term used when Phytoplasma, a specialized bacterium, attacks the phloem of a plant. Phytoplasma infection is characterized by chlorotic small leaves, shortening of internodes, excessive lateral shoots and abnormal flowers. Although there have been reports of this disease within the passion fruit plant, many infected plants are affected without visible signs of disease. Although Phytoplasma can be spread through grafting, it can be inhibited by periodic inspection of plant nurseries and areas that have had past infections. Overshooting responds to treatment with tetracycline, a common broad-spectrum antibiotic. Bacterial leaf spot, which causes vein clearing, forms bright yellow colonies causing infection and leaf wilt and, eventually, deterioration of fruit pulp, especially of young fruits. Under favorable conditions for the bacteria, infection occurs through natural openings or wounds from other pathogens that affect leaf inter-cellular spaces. Fertilizers or a copper chloride and mancozeb mixture can control the intensity of the disease, but are not a cure. The bacterial grease-spot of the passion fruit is caused by Pseudomonas syringae. It appears with olive-green to brown greasy-looking spots or brown, sunken circular lesions. On a later stage, a hard crust can cover the lesions showing a chlorotic halo. Affecting mainly the stomata, the grease-spot thrives in high temperatures and high relative humidity. To avoid infection, measures that may be adopted include planting seeds from healthy plants and using existing healthy areas. Fungicide controls can aid in preventing further infection. Collar rot disease is caused from the fungus Fusarium solani. It is characterized by necrotic lesions at the collar region, browning of the stem at soil level, and dark discoloration of the stem. The rotting stem interferes with food and water transport within the plant, leading to withering of the plant until death. Infection occurs mostly through contaminated soil and infected plants which cause the plants to survive for only a few weeks. There are no chemical controls. Management includes planting seedlings in unaffected areas and using clean tools. The fungus called fusarium wilt commonly occurs in adult plants and is caused by Fusarium oxysporum. The pathogen has ability to survive for long periods, penetrating roots, invading the xylem and preventing the transport of water and nutrients to other organs of the plant. Once infected, this disease causes leaves to yellow and browning of the vascular system until it wilts and dies. It occurs in any type of soil infecting all plants. Management of crops include planting clean seedlings, uprooting and burning infected plants, and using sterilized tools. The anthracnose, a canker caused by Colletotrichum gloeosporiodes, is a pathogen of the passion fruit creating dark and sunken lesions of the trunk. By attacking mature passion fruit trees, these lesions cause intense defoliation and fruit rot. Many leaves die due to the foliar lesions and the skin of fruits becomes papery. Under warm and humid conditions, this disease can worsen, causing red and orange spores eventually killing the plant. 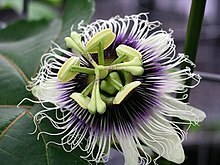 Infection is carried out through the residues of the passion flower, infected seeds, seedlings, and cuttings. Managing this disease involves a combination of using pathogen-free seedlings, eliminating infected areas, and improving ventilation and light conditions. Copper-based fungicides on injured areas can prevent the spread of disease. Passion fruit flower is the national flower of Paraguay. ^ a b c d e f g h i j k l m n Morton JF (1987). "Passionfruit, p. 320–328; In: Fruits of warm climates". NewCrop, Center for New Crops & Plant Products, Department of Horticulture and Landscape Architecture at Purdue University, W. Lafayette, IN, USA. Retrieved 1 July 2014. ^ Davidson, Alan (2014). Passion-fruit; In: The Oxford Companion to Food (page 597; Ed. 3). Oxford University Press, Oxford, UK. ISBN 978-0191040726. ^ a b c d Yahia, E.M. (2011). Postharvest Biology and Technology of Tropical and Subtropical Fruits: Mangosteen to White Sapote. Elsevier Science. p. 126. ISBN 978-0-85709-261-8. Retrieved Jun 1, 2018. ^ "Passiflora edulis". Germplasm Resources Information Network (GRIN). Agricultural Research Service (ARS), United States Department of Agriculture (USDA). Retrieved 2010-01-07. ^ Boning, Charles R. (2006). Florida's Best Fruiting Plants: Native and Exotic Trees, Shrubs, and Vines. Sarasota, Florida: Pineapple Press, Inc. pp. 168–171. ^ a b c d "Passifora edulis (passionfruit)". Centre for Agriculture and Bioscience International. 21 January 2016. ^ Ngotho A (October 30, 2012). "Passion fruit farming the next frontier in agribusiness". The Star, Nairobi, Kenya. Retrieved July 16, 2014. ^ Sridhar, P. (8 November 2011). "HRS cultivating 'passion fruit'". The Hindu, India. Retrieved 19 June 2016. ^ "Nutrition facts for Passion-fruit, (granadilla), purple, raw, 100 g". USDA Nutrient Data, SR-21. Conde Nast. Retrieved April 2, 2013. ^ "Passion fruit: Passiflora edulis / P. edulis flavicarpa, Passifloraceae". California Rare Fruit Growers. 1996. Retrieved 25 July 2016. ^ Schotsmans, W. C; Fischer, G. (2011). "Passion fruit ( Passiflora edulis Sim.)". Postharvest Biology and Technology of Tropical and Subtropical Fruits. Elsevier. pp. 125–143. doi:10.1533/9780857092618.125. ISBN 978-0-85709-090-4. ^ "Passion Fruit". California Rare Fruit Growers. 1996. Retrieved 5 April 2017. ^ Grissell, Eric (6 May 2013). "Carpenter Bees: The (Harmless!) Garden Pollinators". Mother Earth News. ^ a b Amata RL, et al. (June 2011). "Manual for identification of passion fruit diseases and their management" (PDF). www.kari.org. Horticulture and Industrial Crops, Kenya Agricultural Research Institute, Nairobi. Retrieved 14 December 2014. ^ "Fusarium wilt of passion fruit". PaDIL, an initiative of the Australian Government’s Department of Agriculture. 2007. Retrieved 16 December 2014. ^ "Paraguay: national flower". Paraguay.com. 2009. Retrieved 1 July 2014. This page was last edited on 5 April 2019, at 00:36 (UTC).